I’ve been hanging around the bookish parts of the web for a while now, and I’m still astounded by how quickly you kids can devour books. There are people on my Goodreads feed who can finish five to 10 books in one week. And I swear, speed-reading must be a prerequisite for being a book blogger. 1. I’m always behind the latest bookish trends. I have no idea what titles the cool kids are currently reading. I’ve read a lot on the Twitters about An Ember in the Ashes. I look forward to finally finishing it in December 2018. 2. I’m constantly getting spoiled. I was planning to read Me Before You before Twitter/the media/my mom revealed how unhappy of a romance it was. 3. Goodreads is constantly stressing me out. I’m currently 16 books behind on my 2016 reading challenge, and one of my “Currently Reading” titles hasn’t been updated since June. Thanks to technology, my book anxieties can now be quantified. 4. I keep forgetting what I’ve read. I don’t have favorite characters. I don’t have favorite scenes. I have only those parts of the book that I can actually remember. 5. I’m always being judged by other readers. I told a co-worker I was reading Homegoing and she replied “Still??? ?” Yes, Heather. Still. Thanks for bringing that conversation to a screeching halt. This one is only partially true. I feel terribly guilty about all the books I haven’t finished. I buy new ones, anyway. 7. I constantly owe my library money. Because not only am I slow, I’m unorganized. Hello, late fees. I know I can’t be the only one who takes their sweet time with books and would love more slow-reading friends. Hit me up! 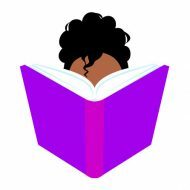 Follow my personal Twitter or chat books with me and Elizabeth at @blackchicklit. First of all, your GIF game is on point! Secondly, I am with you! I read so slowly and I want to do better :(. I have a daunting TBR list I’m afraid I’ll never complete and that hurts me LOL. Let’s support each other and do better! Also, I see the start of a book club/support group. I have switched now to audible. I’m horrible and lazy, I know. But that was the only way I could finish “Year Of Yes.” I regret nothing. Haha’ I’ve listened to a LOT of audiobooks this year (after years of “physical books only” snobbery). I still feel a little weird about it, but I can’t say that I regret it.